You don’t have to be a tennis player to get tennis elbow. Any physical activity that requires repetitive arm or wrist movement can trigger tennis elbow. Also known as lateral epicondylitis, tennis elbow is usually caused by the overuse of muscles and tendons around the forearm and elbow joint. This can cause pain or soreness around the outer part of the elbow. The tendons also are involved in wrist movement and, when inflamed, can cause pain. Tennis elbow very often affects people between the ages of 35 and 65. It is very common among people who play tennis, racquetball, badminton, squash, fencing and weight lifting. It also affects people with jobs or hobbies requiring repetitive movements like carpentry, using plumbing tools, typing, painting, raking and knitting. It mostly affects the dominant arm. Symptoms of tennis elbow may vary in intensity and can include elbow pain, a weak grasp, wrist pain while grasping objects, difficulty in fully extending the forearm and pain when lifting or bending your arm. An episode can last several weeks or months, even years because tendons heal slowly. Usually tennis elbow will heal on its own. You just need to give your injured arm a break. You can also try some remedies that can alleviate the pain and speed up the healing process. 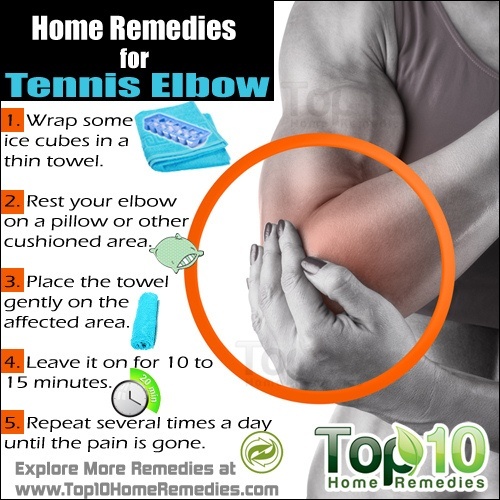 Here are the top 10 home remedies for tennis elbow. Also, consult your doctor for proper diagnosis and treatment. Icing the elbow is one of the simplest and easiest ways to reduce pain and swelling. Ice may also help to prevent progression of the condition. Instead of ice, you can also use a frozen pea bag. Wrap some ice cubes in a thin towel. Rest your elbow on a pillow or other cushioned area. Place the towel gently on the affected area. Leave it on for 10 to 15 minutes. Repeat several times a day until the pain is gone. Note: Never put ice directly on the skin. Contrast hydrotherapy, which means alternating hot and cold compresses on the affected area, is another good remedy for tennis elbow. While the heat will increase blood circulation and reduce pain, the cold will reduce inflammation as well as swelling. 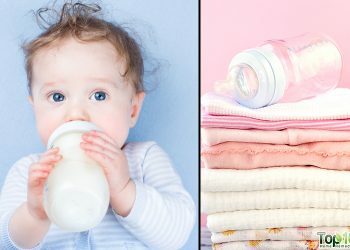 Wrap a hot water bottle in a thin towel and wrap some ice cubes in another towel. Place the hot compress on the affected area for about three minutes. Remove the compress and immediately put a cold compress on the affected area for about one minute. Continue alternating compresses as noted for 15 to 20 minutes. Follow this remedy a few times daily until you get relief. Turmeric contains curcumin, which works as an anti-inflammatory agent as well as a natural painkiller. Furthermore, turmeric is rich in antioxidants that eliminate free radicals and speeds up healing time. Mix one teaspoon of turmeric powder in one cup of milk. Heat it over low heat. Add a little honey and then drink this twice a day, at least for a few weeks. Another option is to take 250 to 500 milligram turmeric capsules three times daily, but consult with your doctor first. Ginger has strong anti-inflammatory properties that help a lot in alleviating the symptoms of tennis elbow. Cut a small piece of ginger root and boil it in two cups of water for 10 minutes. Strain and add a little honey. Drink it slowly, three times daily until the pain is gone. Applying a ginger poultice on the affected area will also help. Take four tablespoons of freshly grated ginger and wrap it tightly in a cotton bag. Put the bag in hot water for less than one minute and allow it to cool. Put it on the affected area for 15 minutes. Repeat the process several times daily until there is improvement. Massaging the affected area with calendula oil or avocado oil is another effective home remedy for tennis elbow. Both calendula oil and avocado oil can give relief from inflammation and pain. Plus, massaging improves blood circulation and soothes sore muscles. Apply oil on the affected area. Do friction massage by rubbing your thumb back and forth over the sore tendon. Another option is to go for trigger-point massage using firm, long strokes. You must massage two or three times daily until the pain is gone. Watch this video to learn more about tennis elbow trigger-point massage. Due to its anti-inflammatory properties, St. John’s wort can also help heal a tennis elbow. Additionally, it works as an analgesic for pain relief. Mix two teaspoons of dried St. John’s wort in a cup of hot water. Cover and steep it for 10 minutes. Strain and add a little honey. Drink two cups of this herbal tea daily until you get the desired result. 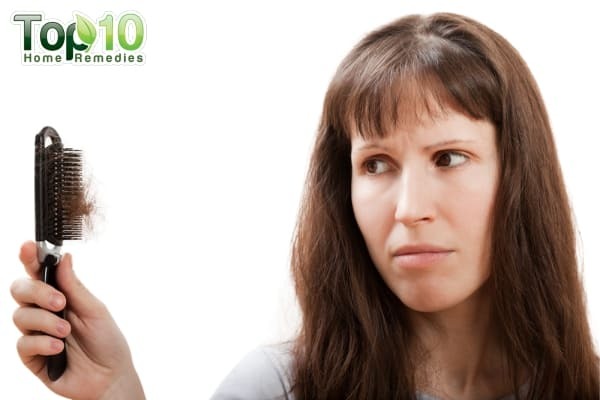 Alternatively, you can apply St. John’s wort oil on the affected area several times a day for a few days. Note: Do not use this herb if you are taking any prescription medication. 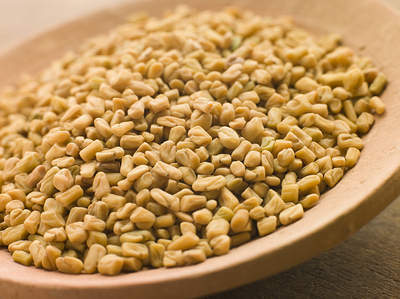 Fenugreek has anti-inflammatory properties that can help reduce swelling and inflammation. This in turn will speed up the recovery time. Grind one to two tablespoons of fenugreek seeds along with enough milk to make a paste. Apply this paste on the affected part and leave it on for one or two hours. Rinse it off with warm water. You can also eat one teaspoon of finely ground fenugreek seeds along with a glass of lukewarm water daily in the morning. Follow both these remedies once daily until the pain is gone. 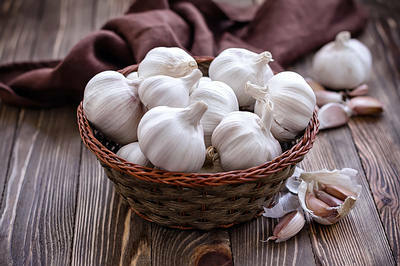 Being rich in sulfur and selenium, garlic is also very helpful in the treatment of tennis elbow. Garlic can relive pain as well as inflammation. Heat four crushed garlic cloves in two tablespoons of mustard oil until they turn dark brown. Strain and allow the oil to cool until it is comfortably warm. Apply the oil on the affected area. Massage gently for a few minutes and then leave it on a few hours. Follow this remedy twice daily for several days. Also, eat two or three raw garlic cloves daily. If you are deterred by the smell or taste of garlic, consider taking garlic supplements but only after consulting your doctor. Another effective herbal remedy for tennis elbow is white willow bark. Due to the presence of a compound known as salicin, white willow bark works as a natural painkiller. 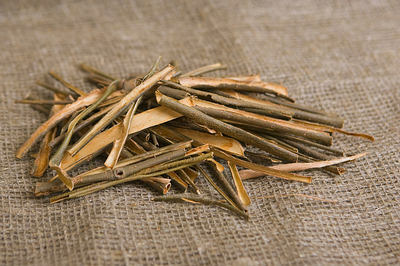 Add one teaspoon of dried white willow bark to a cup of boiling water. Cover and steep for 15 minutes. Strain and drink this tea while it is still warm. Do this daily until you feel better. 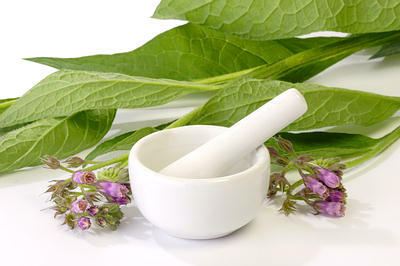 There are certain chemicals in comfrey leaves that aid the body’s natural healing abilities. Also, these leaves work as a mild painkiller. Soak comfrey leaves in hot water until they become soft. While they are still warm, press the soft leaves on the affected joint. Wrap a cloth around it to hold the leaves in place. Follow this remedy daily until the swelling and inflammation is gone. After that, you can rub comfrey oil gently on the affected area twice daily for several weeks. It is often difficult to prevent getting tennis elbow. 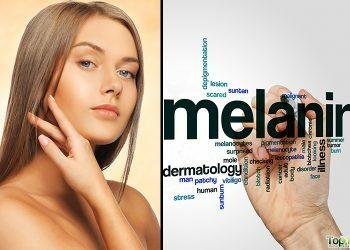 However, there are certain tips that will help you avoid the condition or prevent the symptoms from getting worse. Rest the affected arm as much as possible for the first two weeks. Rest your arm on a few pillows to keep it elevated above your heart. An elbow wrap or brace can be used to promote healing while alleviating pain. Try some simple stretching exercises for rehabilitation. Perform range of motion exercises to reduce stiffness and increase flexibility. 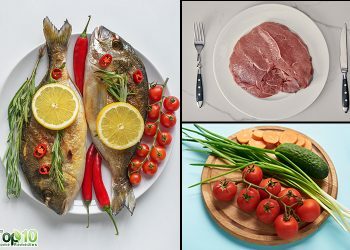 Try adding more omega-3 fatty acids to your diet. Before playing a sport, warm up properly and gently stretch your arm muscles to prevent injury. In most cases, these home treatments will help reduce the pain, swelling and inflammation. But if you have a severe case of tennis elbow that doesn’t respond to these home treatments, consult your doctor. Some cases may even require surgical treatment. Excellent suggestions. The Cold pack + hot pack + ayurvedic oil massage + exercise suggested was very very good. Keep up the good work. Thank you.